It might be difficult for Northwesterners to believe that I once planted — intentionally! — a blackberry bush. It was small and anemic and cost $6. I found it a nice spot on the side of the chicken coop, dug a hole, settled it in, watered it lovingly… and forgot about it. A few months later I remembered and went to check on it, and all that was left was a little brittle stick. I’m not sure why blackberries don’t do so well in Southern California. I suspect it has to do with the inherent dryness and lack of rainfall. They grow prolifically in Northern California. But in the Northwest, they are practically a plague. Indeed, I recall coming to my wife’s sister’s property more than a decade ago, before we were married, and nearly the entire four acres was one massive blackberry bramble. Delicious and romantic to the dusty Southern Californian, but a significant complication to the prospective home builder. The blackberry bramble is a beautiful metaphor for many things — ambition, love, religion, even life itself. The promise of exquisite bliss wrapped in ever-present thorny peril. Pick carefully, and you will be rewarded sumptuously. Step in the wrong place and you will tumble into misery. Speaking of misery, my two-year-old daughter, Imogen, tends to wake up at 5:30 a.m. Less a dilemma at home, where toys and routine carry you through until more civilized hours. But more challenging whilst vacationing at the homes of friends and family, and not wanting them, too, to be subjected to such an early rousing. Like many great food destinations, the Northwest is blessed by a convergence of fertile earth, abundant wild foods and sophisticated tastes — those places where culinary poetry is born. The blackberry brambles, mushroom-dank forests, cherry orchards and wine vineyards spill from the country right through the suburbs and to the very peripheries of Portland proper. And the chefs and cooks take full advantage. I remember my first grown-up trip to Portland, 15 or so years ago — sitting in the lobby of the historic Heathman Hotel, eating oysters and fois gras, then a few nights later sipping champagne and eating Columbia sturgeon caviar at a private reception where Pink Martini provided the entertainment. It would be an auspicious beginning to my relationship with the city. The waning trend du jour in Los Angeles is the food truck. 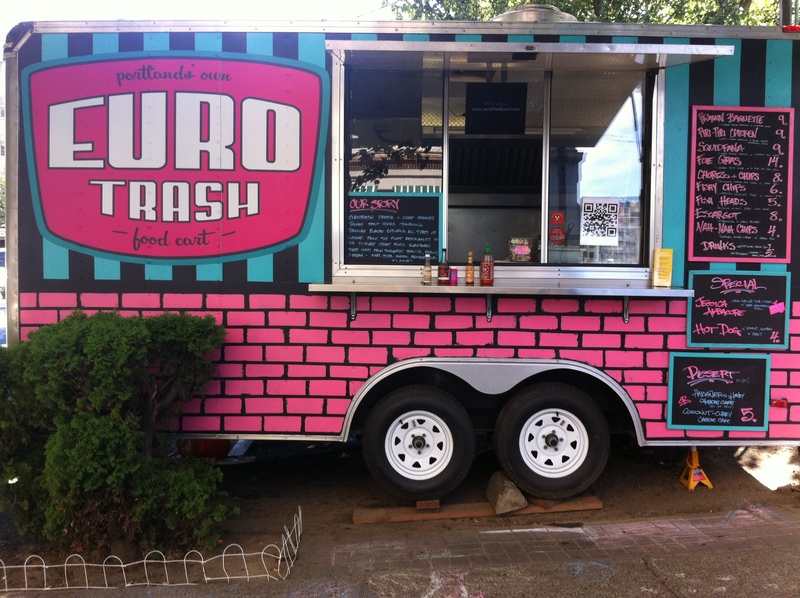 We’ve long been accustomed to the “roach coaches,” food trucks run by Mexicans selling tacos, tortas and burgers. 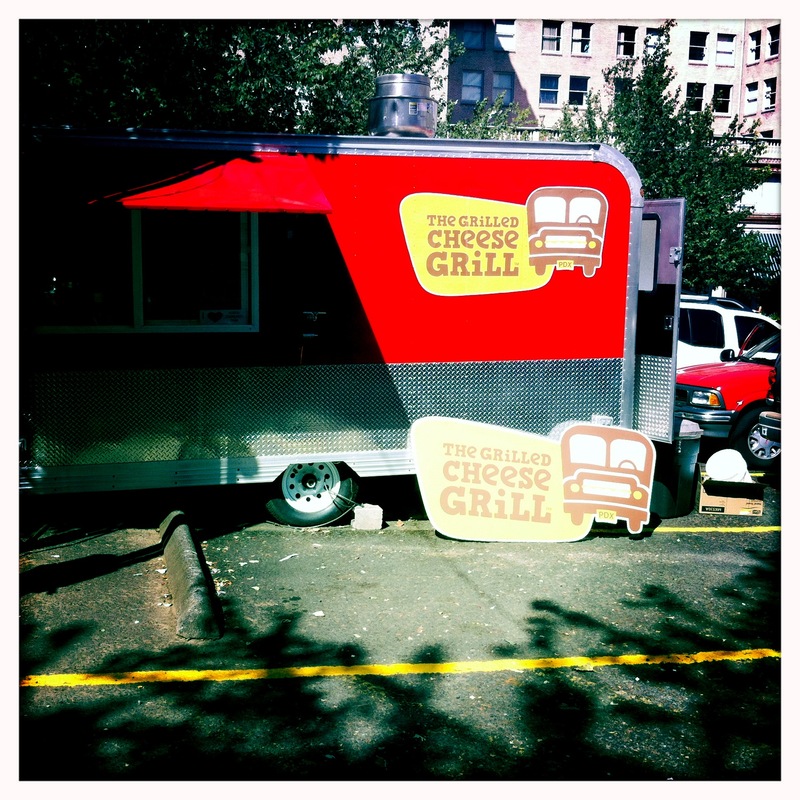 Then a few years back, a couple enterprising chefs got the idea to go upscale with the trucks. Soon there were caravans of the trucks circling the city, the few great ones locatable via Twitter and the vast majority of mediocre copycats littering corners and parking lots throughout the metropolis. 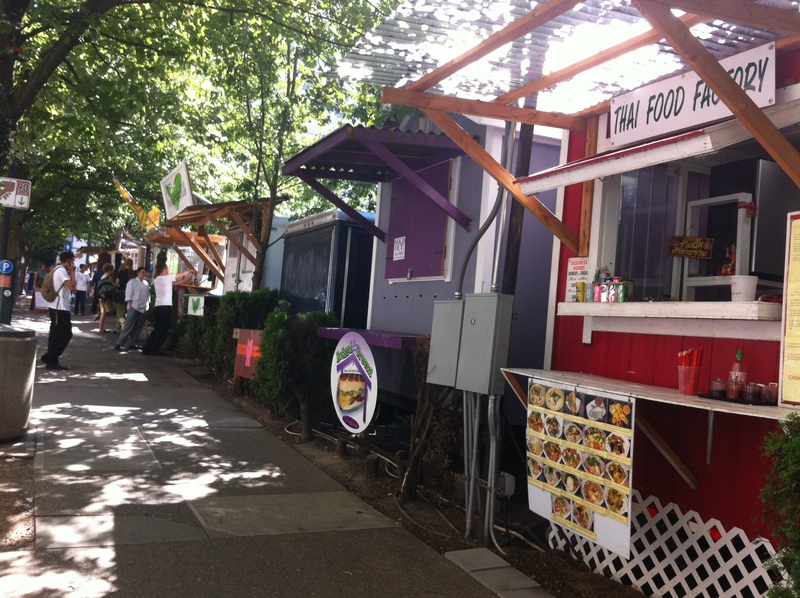 In a scalable version for a more intimate city, Portland has the food cart. 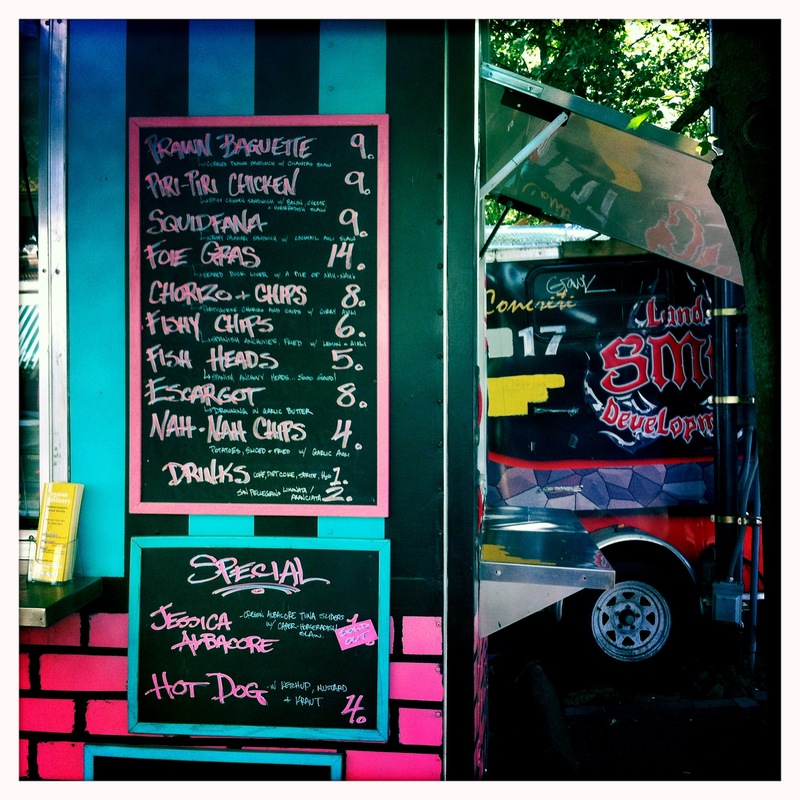 But unlike L.A.’s faceless corporate trucks, the stereotypical Portland food cart is as unique as a fingerprint. Located throughout the city in “pods” or as lone wolves, they appear like a food truck crossed with a toad stool, many looking like they’ve been there forever — the pods seeming to have burst up in fairy rings. We checked into our downtown hotel and ventured out for a late lunch. Portland pal Gary had told us there were food carts near our hotel. So we sleuthed around like mushroom foragers hunting fertile grounds. And then we turned a corner, and there they were — carts! of every size and color, cuisines and cultures from tropics to poles, Far East to Old West represented. 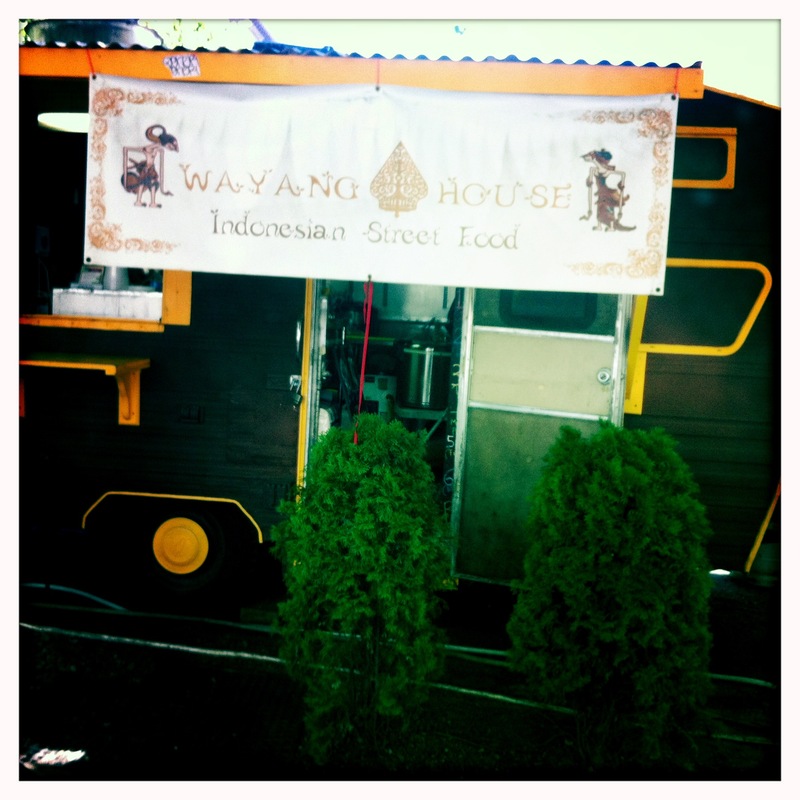 There was Indonesian street food, Kosher Egyptian food, Carolina barbecue and Memphis barbecue, five or six representatives of both Thai and Mexican, Hawaiian bento, Hawaiian plate lunches, Hawaiian grill. In all, some 40 or 50 carts comprised this particular pod, ranging from souped-up affairs to ramshackle trailers. There was a carnival-like, festive atmosphere to the pod, like we were all of us there, the vendors and customers alike, sharing in some wonderful social culinary experience. We sampled an array of plates — my wife gravitated toward the Belgian frites and mayonnaise while I began with a tempura soft shell crab and moved on from there. We ate in a park across the street and returned for a round two of Vietnamese crepes and fat burrito. What would define the carts the most is the warmth of their idiosyncratic personalities, in stark contrast to the feigned exclusivity of the L.A. food truck. I was served Ethiopian food by an old couple as beautifully exotic as they were gracious. 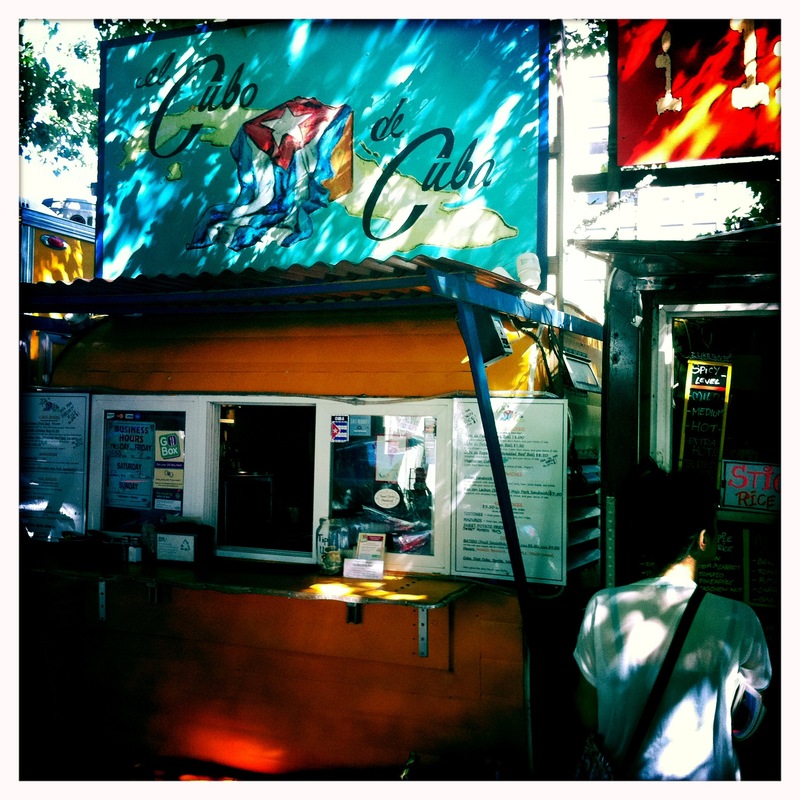 The Creole man and woman in the Southern food cart looked as if they had only just crawled out from a bayou. A crusty Scottsman offered fish and chips, while a young Indian woman hawked vegan curries with a radiant smile. We had, as we always do when we travel, intrepid and optimistic plans to venture out to a restaurant and eat a civilized dinner like regular adults. And then our 2-year-old lived up to the terrible reputation of her like and had a conniption fit in the lobby of our hotel during the complimentary wine happy hour. So we would dine at neither the groovy brasserie around the corner nor the upscale creative fusion Asian joint friend Gary recommended. We will spread out towels on our hotel floor, pour some wine, turn on the Olympics and eat en suite. But every cloud has a silver lining, and ours is another opportunity to explore the culinary universe a block up and over. Beautifully written, You’re getting better and better my Son. Sound like a mother? Those who know me know the compliments are not flung about like cookies. No she is not a cookie flinger! Thats for sure. Let’s talk soon, Mom. Dude, if somebody doesn’t pick this up for your writing and cooking skills, this planet is off orbit! One of the few blogs I actually read….love your style. Love to see you visit–with us–the New Orleans Jazzfest one year late April and early May (two weekends w/ different headliners & bands each weekend) and wander through the food huts set up in the middle of the raceway tasting your way through that melange of regional delights. Then head to some of the restaurants in the French Quarter and outskirts beyond. Regional cuisine from the Northeast to the Southeast in this great countery of ours is such a treat. It would give you another 10 or 15 blogs worth and we could enjoy great craic and listen to some great music from Klesmer & Gospel to Rock & Soul. Our thornless blackberries are growing crazy in the secret garden under the Guava tree that is kicking out loads of beautiful red fruit this year for future homemade paste for croissants and Thanksgiving dinner sauce. Have another cookie my brother! Sounds like heaven Pal-o! We”ll have to make that happen when the kids are a bit older. A neighbor on Lower Encina has planted some trellised blackberries, and I just had to shake my head and laugh. But look how healthy the weedy ones are by Bob Heldman’s house! 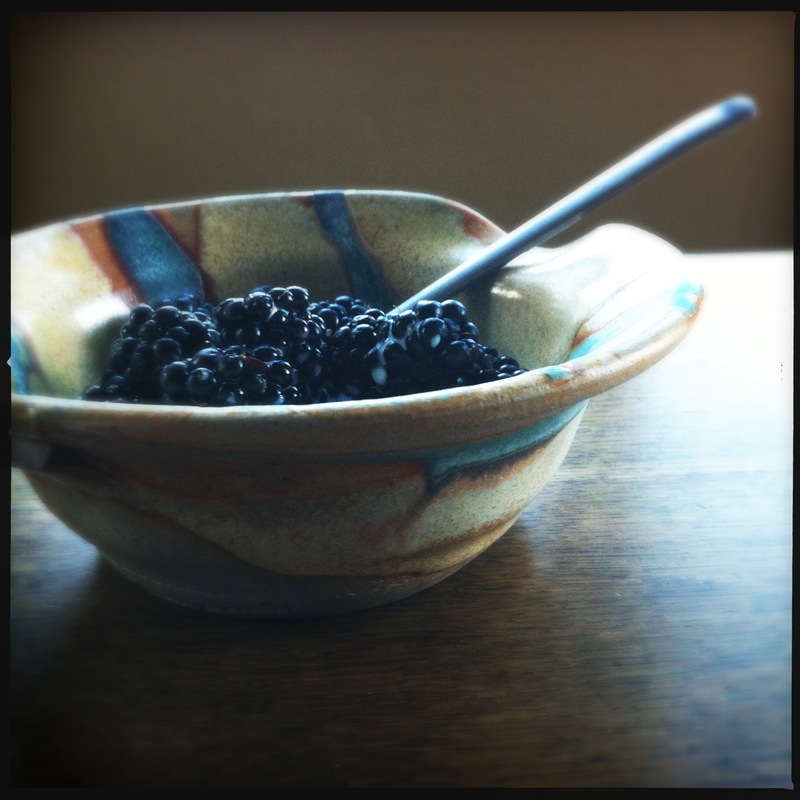 I used to pick blackberries from the shrubs in the overgrown vacant lot across the street from my house in Seattle. More than enough for a season’s worth of jam! Let’s just see them try to grow nopales in the Northwest! 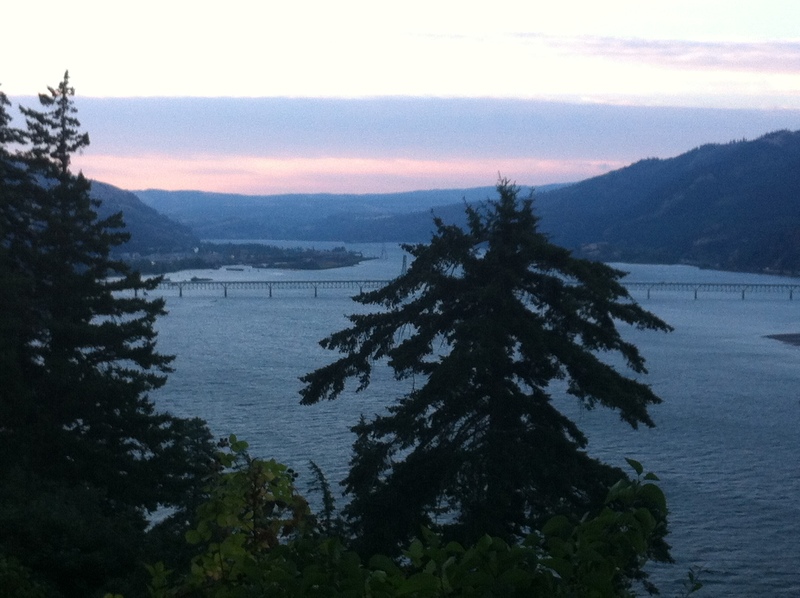 And Portland is wonderful, truly.